7/12/2003 Over 1,100 Articles Posted! 7 Salvation Page Downloads Per Hour! Removal intructions are at the bottom of this email. If you have experienced joy in how the Lord has used you in ministry I would not rob you of one precious drop of rejoicing, for we are indeed privileged that the Lord would be pleased to use instruments such as us. I would caution you, however, to embrace the New Covenant as your protection against an enemy that will surely rise to challenge your joy. Although it is obvious that only the Spirit of God could effect such spiritual results from such a minor human source, yet the pride of our hearts is such that our natural self would want to exalt the channel above the Living Water that flows through it. The Lord used you as He used the clay and spittle when He graciously brought sight to the man born blind. It was because you were available as simple clay in His hand to be applied to the eyes of others that He was pleased to use you. How proud must be our natural hearts to glory in mere mud and spit! If He used a handful of damp earth to grant the miracle of sight to a man born blind, we must not become proud if He condescends to use us for the same purpose. I am sure you were humbled by the favorable response to God's amazing hand upon your life. It was, without doubt, a visitation of the Lord. He was using you as clay to bring sight to the multitudes. I am sure, although you were pleased to be so mightily used of God, that the prayer in your inner spirit was that others might see the Lord. For this, others were doubtlessly praying. In the Apostle John's record of the healing of the man born blind, the man did not actually see the Lord until the clay, which was used to anoint his eyes, was washed away. He had to go to the pool of Siloam to wash away the mud compact that had been applied to his eyes. We may well picture the man stooping over the water with his hands cupped, washing the clay out of his eyes. The faster the clay disappeared, the clearer his vision became. It was when the clay was completely washed away that he was able to see Jesus. Rejoice that the Lord will use you as He used the clay and the spit. You were an anointed instrument in His hand. We are only His instruments. Being used to anoint blind eyes is only the beginning. Afterward we must be washed away so the restored ones can focus on Jesus only. While they look at you or me, or any human instrument, they will never see Jesus clearly. You have been mightily used, but do not be disheartened if the wonder of that redemptive experience swiftly passes away. It must pass away! Those who were so helped by your healing words must now go to the pool of Siloam and wash it all away. While you are in their eye, they will not be able to see Jesus. When I was starting Cutting Edge Ministries, I simply wanted to be the instrument by which God would open the eyes of the spiritually blind in this End of the Age period, a time Jesus prophesied would be as spiritually blind as any in world history -- even perhaps an unprecedented era of spiritual deception. I did not have Brother Miller's "Clay and Spittle" analogy to pattern Cutting Edge after; however, I did have a wonderful sermon preached in the early part of this ministry that so impacted me that I set this view of the ministry constantly before my eyes. Literally, God has used Cutting Edge in just the way we explain in the Conclusion of this newsletter. NEWS BRIEF: "Full-scale flare-up of the Iraq War may be imminent", DEBKAfile Intelligence, July 11, 2003. 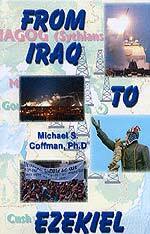 "... reports from our military and intelligence sources that a full-scale flare-up of the Iraq War may be imminent. Both sides are said to be assiduously girding up for a fresh round of warfare ... There has been no changing of the guard on the Iraqi side. Saddam and his two sons are the unquestioned leaders of the next armed campaign against US forces. They are supported by the same officers who led the Special Republican Guard divisions against the Americans in the first stage of the conflict in March and April." This is a very serious development, because the Iraqi Army gave our boys, and the British, all we could handle in those first two weeks. However, Saddam never allowed his army to use the really state-of-the-art weapons they possessed: Refurbished Russian tanks, 350 fixed-wing aircraft, 5,000 Hind assault helicopters, shoulder-fired anti-aircraft missiles, and the majority of the Russian latest anti-tank T.O.W. weapon. Saddam also did not use any of his Weapons of Mass Destruction, whom we believe he possesses because the Illuminati gave it to him! Saddam strategically gave up Baghdad so that the Coalition Forces would send their four aircraft carriers home and most of our Air Force planes. Thus, were he to strike again, he would be pitting the best of his military against less than our best because we sent so much equipment and men home. If Saddam uses WMD weaponry now, in addition to the best of his carefully preserved conventional military, we could suffer great losses. We might just decide to use our nuclear weapons on his forces if he is giving ours a really hard time, a decision that would come back to haunt us greatly. "The three to five daily attacks a day the Iraqi resistance proves able to mount against US troops, indicate impressively the hand of professionals at work. These forays have two clear goals: One is to dampen American troop morale by building up the casualty score; the second is tactical, to repel American military incursions into an enclave beneath whose surface Saddam and his allies have dug deep to establish their underground fortress cities." In March - April, when we talked about large underground cities and highways so wide that two armored personnel carriers could pass each other, we received a lot of negative feedback, even ridicule; however, former a Army officer whose expertise was Logistics tells me that this story is absolutely true in Iraq, but it is equally true in the Korean Peninsula. The Russians have always been the world's best in digging and they have dug in Iraq and North Korea for decades preparing for this moment. The approaching round of hostilities is estimated by DEBKA-Net-Weeklys experts as a high-risk, winner-takes-all venture that will finally resolve the outcome of the Iraq War. The Americans hope to do away with Saddam Hussein once and for all, while the ousted Iraqi ruler is gambling on repelling the American coup de grace and so smoothing the way for his return to power in Baghdad and anointment as hero of the Arab world. According to our exclusive military sources, Iraqs ex-ruler and his men are preparing a battery of medium-range ballistic missiles, some tipped with chemical and biological warheads for the American troops coming to get him." The climactic battle for Iraq may thus be just days away, with our men fighting in 110 degree heat, dressed in bulky bullet-proof combat gear; should our troops have to don chemical protective suits, many Americans could die simply from the heat. This is the absolute worst time of the entire year to be fighting in Iraq! We encourage you to read this article fully, for time and space does not allow us to reveal every detail. What does the old saying go? "It's not over until it is over". 2. Israel - Palestinian State -- Yasir Arafat has always been a buddy to Saddam Hussein; during Gulf War I, Arafat verbally supported Saddam all the way through to defeat. During this current Iraq battle, Arafat has unswervingly supported Saddam; therefore, it is not a surprise to learn that Arafat is planning to support Saddam once more. DEBKAfile Intelligence is also reporting that Arafat is planning to synchronize a new wave of terror attacks with Saddam's launching of Stage 2 of Gulf War II. "DEBKAfile reports Israeli security fears Arafat will activate his new terrorist enclave for a mega-attack in an Israeli city and suicide campaign  synchronously with revived warfare in Iraq. Counter-terror experts reveal large-scale strikes prepared in Ramallah with Iraqi and Hizballah experts ahead of Iraq War. London Observer reports IRA bomb expert arrived in Israel three weeks ago to train Palestinian terrorists in new mega-attack techniques." If Arafat successfully launches mega-terror attacks, causing at least as much damage as our 9/11 attacks, Israel will, in all probability, go to war. Once she goes to war against the Palestinians, and commits large-scale troops to the battle, Syria and Egypt are primed to launch attacks against the borders. Just recently, Syria completed a strategic withdrawal of her Army to positions from which she could launch a conventional attack. We may yet see a simultaneous battle between Iraqi Army vs Coalition Forces and Israel vs Arab Neighbors. If this combination occurs, Iran's strategy of "lighting many fires" to combat the United States will be fully in gear; Pakistan/India and U.S./Afghanistan war may complete the scenario of a Middle East fully engulfed in the flames of war. Now, the question of the hour would be: how far behind this Mid-East conflagration will the North Korean/American war be? Just as with so much else occurring in our world today, the truth lies in exactly 180° in the opposite direction: Abbas was plucked out of obscurity simply because he was very, very obscure to the average American, so he could be the front man for the new "Palestinian State" that Bush and Sharon were determined to proclaim [Read NEWS1819 to learn how this proclamation of a Palestinian State fulfilled Isaiah 34:12]. Abbas looked dignified on camera and thus was the perfect front man of this new, bogus state, the state proclaimed when there was nothing there! The major controversy last week was being fought over the issue of Israel's release of Palestinian terrorists being held in jail. Many of these terrorists were actually guilty of murder of innocent Jewish citizens. Abbas was urging Israel to release ALL of these terrorists, while Bush was urging Israel to accommodate Abbas as much as possible. How would you feel if we suddenly released Timothy McVeigh from prison? While it is debatable whether McVeigh was really guilty of bringing down the Oklahoma City Murrah Building [Read NEWS1347], there is no doubt about these Palestinian terrorists; they are all the real Timothy McVeigh's and yet, we are urging Israel to release them! The only rationale I can see for this ridiculous state of affairs is that we want to further encourage the Palestinians to believe they are winning, and so encourage them to think they can win the war we want them to start. 3. North Korea -- This has long been planned to be the second major war of the World War III, out of which Antichrist will come striding. We saw several ominous developments in this past week. Thus, a "tripwire" may have been crossed last week, but it was the propaganda tripwire designed to begin the drumbeat that we need to go to war to prevent North Korea from getting a "few" nuclear missiles. These stories further stated that the North Koreans probably would develop actual warheads some time just before the end of the year. b. The U.S. began to work with the 10 countries comprising the Proliferation Security Initiative (PSI) to start the practical planning of erecting a naval, air, and land blockade of North Korea, interdicting all ships thought to be carrying materials needed to build these WMD. I note with interest that the Illuminati Antichrist number of "11" is in view here, for the PSI group contains a total of "11" nations [Read NEWS1789 for full review of use of "11" in this entire scenario]. North Korea has always stated that she would consider a blockade to be an "act of war", as North Korea cannot survive an effective blockade for very long. c. The U.S. announced plans to create a new super military base in Hawaii in order to counter the North Korean threat [Gulf Daily News, 9 July 2003]. This new base is planned to "place strike forces and other strategic resources around the world so that they can be deployed and used more swiftly, rather than a slow buildup of forces as happened with the war in Iraq." This article did not state exactly what mix of military forces are being planned to be based in Hawaii. However, a quick look at a map of the world would reveal that such a force would ideally be situated to be used in the Asian theater of the "Non-Integrating" nations [Read NEWS1833 to see why we are invading Africa, and why we are seeing fighting in Indonesia, Pakistan, the Philippines, and many other places. You will be shocked because you will see the final outworking of the plan to create the fully-functioning global Kingdom of Antichrist, a.k.a., New World Order]. NEWS BRIEF: "AUTHORITARIANS GONE WILD", by Ted Rall, Yahoo News, July 8, 2003. "Frightened by Bush's rapidly accruing personal power and the Democrats' inability and/or unwillingness to stand up to him, panicked lefties worry that he might use the 'war on terrorism' as an excuse to declare a state of emergency, suspend civil liberties and jail political opponents ... People who have spoken out against Bush are talking exit strategy -- not Alec Baldwin style, just to make a statement, but fleeing the U.S. in order to save their skins ..."
Ted Rall has just succinctly summed up the majority of the plan to produce the panic necessary so the American people will allow their civil liberties to be suspended, our government to be dissolved and our freedoms taken away, beginning with Bush's political and religious opponents. We have posted an article detailing all the aspects of Ted Rall's article --- NEWS1835. Isn't it ironic that Leftists can see the approaching terror, while untold multitudes of American Christians cannot, or will not, see it? Christians are supposed to use their Biblical knowledge to be able to "judge righteously" so that we can properly discern the events and the people of the day in which we are living. Sadly, instead of Christians being as "wise as serpents" in the matters of discerning these End of the Age times, too many of them are as gullible as geese. "Charles Mandigo, the high-profile head of the FBI office here, poses a provocative question as he prepares to retire later this month: 'What is the quickest way to tyranny and the best way to prevent terrorism? The answer is the same: consolidate law-enforcement agencies.' "
Wow! This is a tremendous admission by an FBI agent who is the head of the FBI office in Seattle, Washington. With his years of expertise, Mandigo can see that the very consolidation of law enforcement that Bush - Ashcroft are saying we need to battle the nearly-phantom Muslim terrorist are the very powers that dictators use to enslave their own population! In fact, in the few years after Nazi government provocateurs burned the Richstag Building down and blame it on the Communists, Hitler rammed through measures that Federalized local and regional police departments, until the point was soon reached where a Hitler directive instantly sprang the local town police chief into action. In like manner, since the Oklahoma City bombing, our state and local law enforcement agencies have become Federalized; this process took on increased urgency after 9/11, until the point is finally reached where most local jurisdictions now immediately follow orders from Washington, D.C.
For many centuries, occultists of the highest attainment have followed the ley lines around the world, and have even drawn their location all over the world. While the term "Ley Lines" is fairly recent, the concept is many centuries old. Occultists believe that certain Ley Lines form Portals or Vortexes which allow inter-dimensional travel and transfer. ["The Planetary Grid,Ley Lines,Vortexes & Interdimensional Portals", http://www.sciforums.com/showthread.php?threadid=997]. Remember, these are occult concepts, not those of Cutting Edge. But, as New Age author, Bill Cooper, said so often, if the Illuminati believes something, you will be impacted -- ["Behold A Pale Horse"]. South Africa is uniquely revered by Illuminists, so it was not surprising that President Bush was there on July 9, 2003, exactly 666 days after the 9/11 attacks. Furthermore, the Illuminati has a unique concept of the world as we draw ever closer to the appearance of Antichrist. Approximately 4 billion people today live in countries known as the "Functioning Core"; these are nations that are fully ready to go into the global economy, government, and religion of the New World Order. However, the remaining 2 billion people live in countries who are so backward, and ruled by such despots, and are torn apart by genocidal civil wars, that they are not ready to enter this global system; these nations are called the "Non-Integrating Gap" countries. The wars currently being fought and those about to erupt, are in countries of the "Non-Integrating Gap". The United States and European Union are following aggressive policies of war and/or threatened war to bring the leadership of these "Non-Integrating Gap" countries down so they can be replaced by leaders willing to bring their population aggressively into the global New World Order. We have issued an article on this subject -- NEWS1833 -- that will answer most of your questions as to why we are invading the Middle East and Africa at the same time, while we are threatening North Korea with war, while Indonesia is invading the Aceh Province and why we are helping The Philippines fight a Muslim insurgency. All these countries are part of the "Non-Integrating Gap"! This may be one of the most important articles we have ever put out, and is must reading if you are to understand the geo-political reality of today's world. In NEWS1804, we wrote extensively about the uranium poisoning we have forced upon the Iraqi people twice -- Gulf War I and now Gulf War II. We demonstrated that our use of Depleted Uranium munitions not only kills the people exposed to the dust of the battlefields long after the battle is over, but kills our own precious soldiers. In Gulf War I, about 75% of our fighting men on the ground are now suffering and dying of depleted uranium poisoning, and many of the wives of these returning soldiers are now fighting similar maladies. Now, Injury Board.com is encouraging anyone who thinks they are suffering from Depleted Uranium poisoning to contact them immediately to join a lawsuit! Last week, we reported an article from MSN.com that Australian servicemen were returning home sick -- with uranium poisoning! NEWS BRIEF: "Australian servicemen and women who served in the recent Iraq war were reporting symptoms of uranium sickness, a United States nuclear weapons expert said. Dr Douglas Rokke is a former US Army nuclear health physicist and was formerly the Pentagon's expert on the health effects of depleted uranium ammunition. Speaking in Melbourne on Monday, Dr Rokke said Iraqi women and children and American and Iraqi military personnel had reported respiratory illnesses and rashes after the recent conflict, and he had also been told of Australian servicemen and women with similar symptoms." While American and British news outlets have remained silent on the subject of uranium poisoning among American servicemen who are in Iraq, we can be sure that reports will soon surface of a supposedly mysterious "Gulf War II Syndrome". American wives need to be cognizant of this danger from sexual intimacy with their returning husbands. Wherever the American military machine invades, we are spreading death and destruction over the whole land. To conquer for Jesus, one does not have to be as brave, strong, and talented as a King David! All one has to be is a person willing to go forth "as lepers" to conquer in Jesus' name. These four lepers "conquered the Syrian Army" simply by being willing to get up off their seats and "go forth" with the power of God going before them! As I sat in the pew that Sunday morning when I heard this message, I was thrilled to think that the task of starting Cutting Edge Ministries was just as simple as being willing to "get up off my seat" and promptly "go forth" with the Holy Spirit power going before me. I got on my knees and on my face, praying that the Lord use me just as He had used these four lepers. Jesus honored that original prayer, as I was attempting to go forth as helplessly and as dependent on God as these four lepers whom He used to conquer a mighty army. "Make your lives significant" is the prayer of millions of earnest Christians today, at this most crucial time in world history. Now you know the true spiritual path to make it happen. It does not matter if you are 10 or 90, or if you have lived a lukewarm Christian walk all your life; now, you know the secret of "conquering for Jesus".